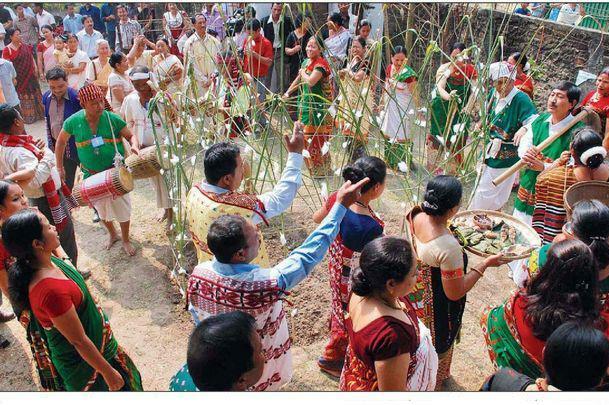 The Mishing or Misíng also called Miri, are an ethnic group inhabiting the districts of Dhemaji, North Lakhimpur, Sonitpur, Tinsukia,Dibrugarh, Sibsagar, Jorhat and Golaghat of the Assam state in India. The total population is more than 8,50,000 in Assam but there are also more than 50,000 Mishing people, divided among three districts: East Siang district, Lower Dibang Valley, and Lohit districts ofArunachal Pradesh. Few of them have settled themselves permanently in National capital Delhi and few hundreds in Mumbai which is the financial capital of India. 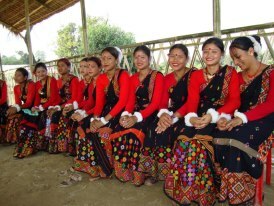 They are the largest tribal group in North-East India, second being to the Bodos in Assam. They were earlier called Miris in historical days. and the Constitution of India still refers to them as Miris. They belong to greater Tani people community which comprises many tribes in Arunachal Pradesh in India and Tibet Autonomous Region (TAR) in China. All Tani tribes sharelinguistic, cultural and ritual similarities. All Misings trace back their root to Abutani or Abo Tani (The first man on earth) like any other Tani tribes. The Misings are East Asian, or more specifically, a Southeast Asian sub-race of the Mongoloid race, similar to the mixture of the Mongoloid sub-races inside political China as people from Southern China may look more like the South East Asian brown-skinned Mongoloids and more towards the Northern China more fair skinned Mongoloids dwell. It's not known exactly where they migrated from, but it is popularly believed that they were dwellers of the hills of present day Arunachal Pradesh. This explains the cultural and linguistic similarities they have with many Tani tribes in Arunachal Pradesh. 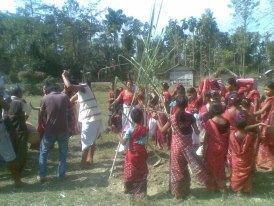 Other Tani tribes are Adi, Apatani, Nyishi), Padam, Minyong etc. somewhere around the 13th century, they started migrating towards the plains of Assam, most probably in search of fertile land. Legends says that they came into contact with more civilised communities living in plains of Assam as early as in the 16th century. Because of this, they lost their violent tribal nature and many embraced the Vaishnavite religion. This exodus continued for at least two or three centuries. There is no written history of Misings about their migration from hills to the plains of Assam. Though they belong to Tani group of tribes and they used to be hill dwellers, they started living on the banks of rivers in the plains of Assam. The reason for this change of habitat is not known, but there are theories. One theory says that Misings presently living in plains of Assam were not a one single tribe, but evolved into one when many tribes from various Tani tribes in Arunachal Pradesh migrated to the plains of Assam in search of fertile land as well as in search of civilisational progress. Over a period of time, they became known as Miris as they acted as middle men between tribes of hills of Arunachal Pradesh and people of the plains of Assam like Ahoms, Kacharis etc. Miri means middle men in the old Assamese language. This explains the presence of many Mising clans with different Mising dialects as well as different levels of development. According to Census of India conducted in 2001, the population of Mising in Assam is counted to 5,87,310; of which 2,99,790 male and 2,87,520 female. MisingTotal population9,20,000Regions with significant populations India (Assam)8,70,000 India (Arunachal Pradesh)50,000LanguagesMising languageThe Mising population residing in Arunachal Pradesh is estimated to be more than 50,000. Literacy rates of Mising tribe is quite high. It is more than 78% among males and 59% among women averaging to be 68.8%, which is higher than that of Assam as well as India. Mising constitute sizeable number of officers of Assam government with ratio much higher than their population. There are now many Mising successful businessmen among Misings. Traditionally, Mising businessmen were into construction line by Assam Government departments like PWD, Irrigation, E&D, NEC(North Eastern Council) etc. But recently, there are many Mising businessman who are into auto mobiles, IT industry too. Misings have got the highest number of doctors in Assam compared to the other tribes in Assam. The Misings believe Abotani as their ancestor is supposed to be a son of mother Sun and father Moon of the Heavenly abode. The Mising people inhabiting by the Plains believe Gumin as one of the earliest ancestors, the forefather of a lineal family of Abotani. The sons of Gumin are grouped in clans (opin), the names of which are represented by the existing surnames in the society. They are all blood related brothers with a social restriction of matrimonial relationship among them. In some localitie, a few non-Mising speaking groups like Bihiya, Samurguria etc. are predominant. These groups write some of their surnames as Saikia, Baruah, Medhi, Kachari, Patgiri Changmai etc. and soon forget their Gu:min and Opin Identity. Moreover, the usage of the term Moyéngia, Oyéngia and Sayengia etc. carry no meaning in determining an opín because families of different Opin are found in the said group. In the same way, the division into Borgam and Dohgam, which was an administrative system introduced during Ahom Kingdom, is non-existent in the society today. As such the multifarious form of division, have no bearing at all in identification of Guhmeen ad Opeen Concept since time immemorial in maintaining their fabric of socio-cultural system. The Opin(Clans) of Gumin are all blood related brothers known as Urom bibosunam Beerrang originating from a common ancestor father and there is no restriction in offering prayers in the Rituals in common platform generations together. There is an another form of brotherhood existing in the society which has been traditionally accepted as affiliated brother or Tomeen sunam Beerrang from different opeen. In both types of Brotherhood marriage among themselves is forbidden in the society. Example: The Opin mentioned above *1. Kuli, Kutum, Kumbang, Koman of Opin Urom Bibosunam Bírrang have affiliated brotherhood with ⇔ *1.Doley, Padi, Ratan, Regon, Like wise for the other in the listing. 1. Kuli, Kutum, Kumbang, Koman. click for mishing songs for free.